At first I flaunted them defied them but as they became more plentiful I decided to hide them. So for now they are hidden away- well for the most part. Happy Birthday! You crack me up with your gray hairs. I'm too vain; I hide mine with highlights and wouldn't be caught dead taking a picture of mine. More power to you! I totally deny mine. I'd have a head of white if I didn't, and I'm just not ready to face that yet...my first gray came in at age 14, and I've colored the rainbow since! I neither flaunt nor hide them. I'd noticed several crop up in the last several years, and then it seems they have multiplied just since Penelope was born! I think they look kind of chic. They seem to be mostly around my temples, and I would be tickled if I had defiant gray streaks. I wish I had your point of view. Mine are somewhat hidden and I will no doubt be one of those old people with hair that you just *know* is dyeing their hair. happy birthday - i used to pull them out until they got too rampant... now it's the bottle. 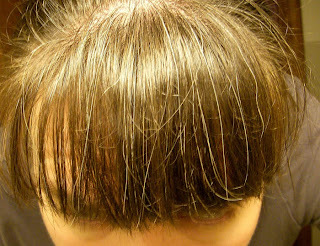 My gray hairs are just there. I don't mind them until I'm trying to curl them to go the same direction as the other hairs, or when I run my fingers through my hair and feel something and go, "What is that??!!! ", thinking something is up there that shouldn't be.